The honest truth? 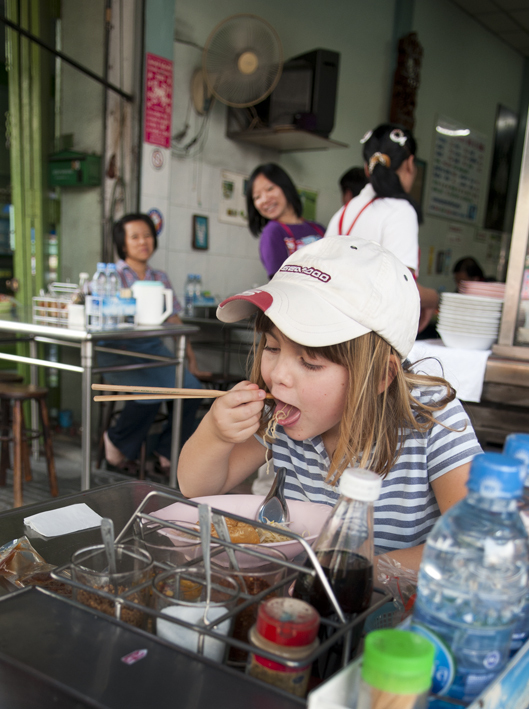 It would have been far easier writing a post about how unchild friendly Bangkok is. But hey, what would life be without a challenge, right? Our kids are pretty much like every other kid out there. They are six and nine years old, and seem to be interested in seeing something different (but not for too long), trying strange foods (as long as they don’t have to finish it), shopping (strictly items for themselves of course, and preferably football related, and why do they never get tired of trying on sunglasses goddamit…), animals (any shape or size), riding weird vehicles (a tuk tuk ride always put huge smiles on their faces) and last but not least, they like their ice cream. The bigger the better. Thrown in at the deep end in Bangkok’s maze of over crowded pavements, crazy traffic and concrete avenues, I felt that our four day stopover would prove a huge challenge. There are only so many Buddhas and temples you can see before the kids start complaining. This caused for alternative thinking, and this is how we not only survived, but somehow managed to get Mattis and Siena to love Bangkok! 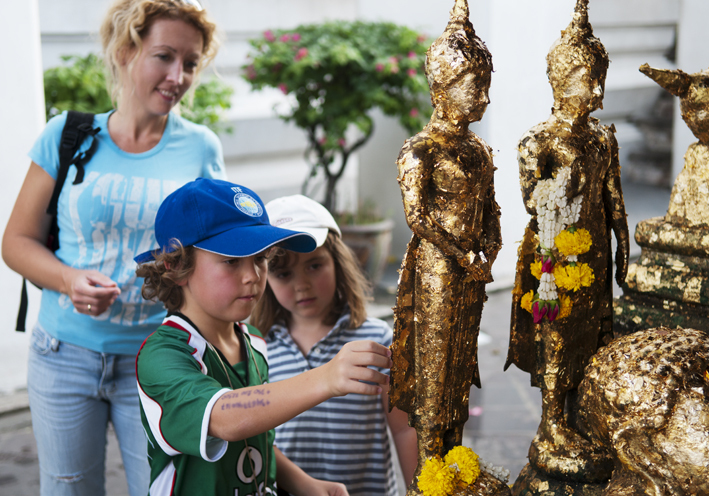 Bangkok is full of beautiful Buddhist temples, but Wat Pho sort of takes the biscuit. Its 43,5 meter long reclined, golden Buddha is as popular with the Thai themselves as with us tourists. The kids loved this place. Not just because the Buddha is a fascinating sight in its own right, but also because the whole site is embalmed in a mystic and serene atmosphere. Best of all? You can buy golden leaf in a little stall, and place them on many of the smaller Buddha statues scattered around the temple area. Khao San Rd. is an exciting place for adults and children alike. Find out more about this weird and wonderful stretch of road in our previous post here. 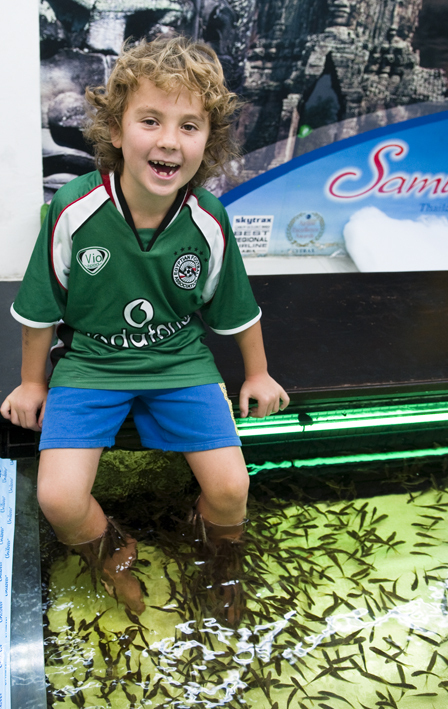 The fish tanks caught our kids’ attention immediately, and it took our son approximately one nano second to kick his shoes off once we gave him the go ahead. First time around we paid 4 euros for fifteen minutes. Second time around, two weeks later, we haggled it down to 2 euros. Wat Prayoon is a surprise of a place, not far from the Memorial Bridge. In fact it’s another temple with lots of little shrines scattered around. However, the biggest draw here is no doubt the huge turtles and fish who live in the small lake. Kids love this experience. First of all because they can get really close to the animals and interact by feeding them. Secondly because it’s a really laid back place with few fences and no traffic what so ever. 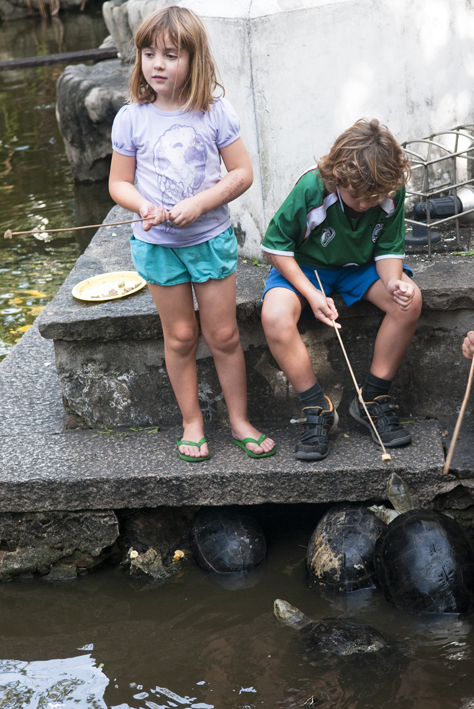 There’s a fruit vendor on site, dishing out bits of ham, sliced banana and those sticks to feed the turtles. Very cheap – 50 centimos for a full plate. 1 – Always put on sunglasses in order to protect our eyes from wind, fumes and dust. 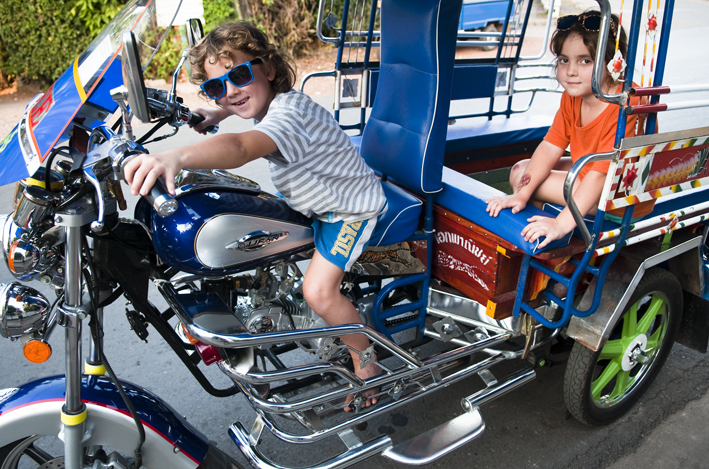 2 – The kids were never allowed to get on the tuk-tuk first, nor to get off it last. I get a bit over protective when we’re travelling, and admit it – I was worried some crazy tuk-tuk driver would take off with the kids. Location: Everywhere! Khao San Rd is a haven for remote control addicted kids! Here you’ll find every shape, size and variety on planet Earth. They were also thrilled to pick up torches, flipflops, t-shirts, football shirts, SUNGLASSES, etc, etc. Our son soon realised how to work his haggle magic, and became an expert at turning his back on the desired item, and saying ‘No, I’m not too bothered’. This would always result in the vendor calling us back with an offer to lower the price. 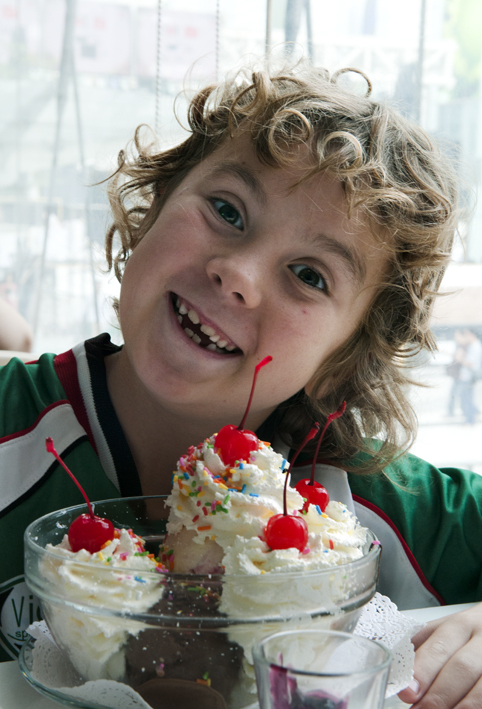 In our family, ice cream is never a bad idea! We tracked down world famous ice cream chain Swensen’s in top notch shopping centre ‘Siam Parakon’. Definitely not a backpacker place, this shopping centre is stricktly for the ones who are not Baht conscious – we are talking brands like Jimmy Choo, Chanel, Gucci, Lamborghini, Porche as well as the five star Kempinski Hotel Siam. Having said that, the ice cream was still affordable, delicious and safe for little stomachs. Prior to arriving in Thailand, we had no idea there would be a Seven Eleven on practically every street corner. 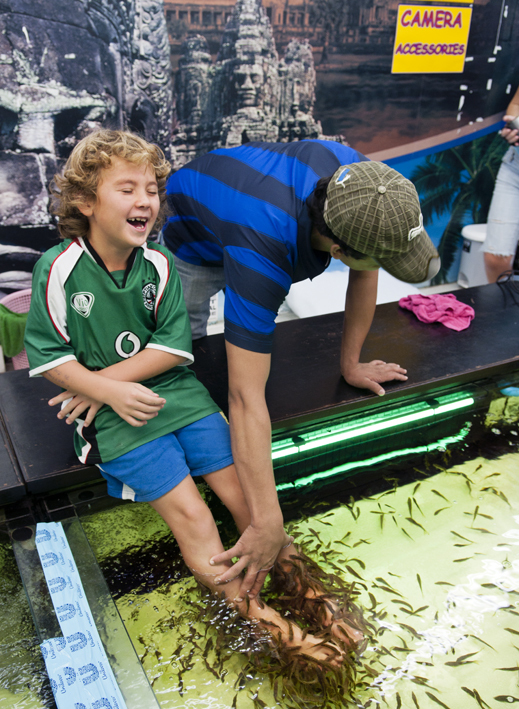 Believe us, it’s an air conditioned piece of child friendly heaven when the intensity of Bangkok starts getting to you. 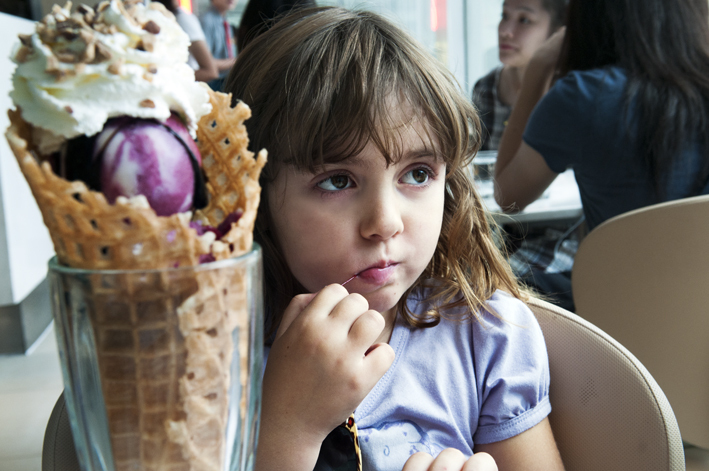 Seek refuge, let the kids pick up an ice cream, browse the weird and wonderful section of crisps and just chill out. As strange as it may sound, we fell in love with Seven Eleven. There’s nothing quite like returning to the same cafe a few days in a row. The staff recognizes you, the menu is familiar, and you know where the best table is. We found our regular place a few blocks down from the hotel. Nothing fancy, just a hole in the wall Thai restaurant, frequented by the locals. We totally recommend this down-to-earth-with-an-arty-atmosphere hotel in downtown Bangkok: Phranakorn Nornlen! 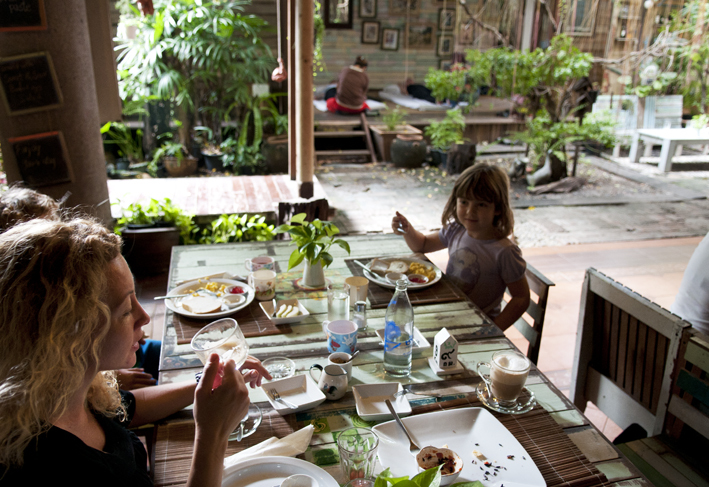 It’s extremely child friendly, and consequently frequented by many families with kids. 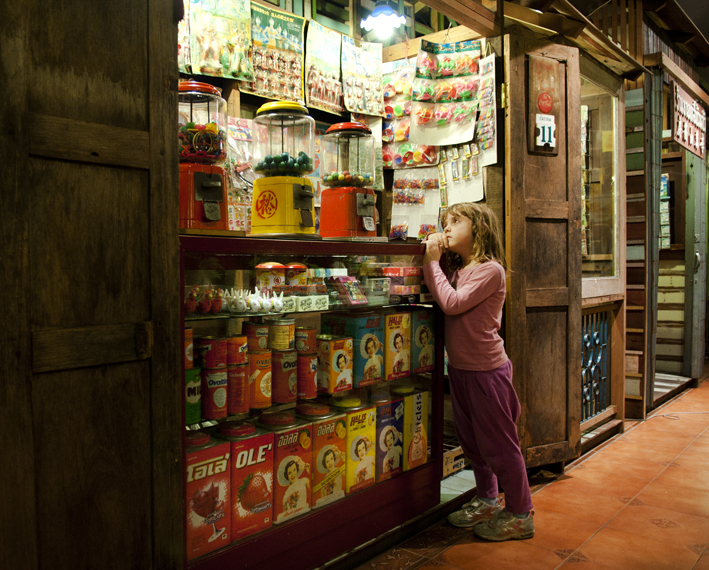 Their breakfasts come with hot chocolate for little vagabonds, and their interior design features vintage sweet shop and toy shop facades. In a pond in the garden, they have tadpoles and frogs which entertained our kids for hours! Another huge bonus are the delicious smoothies which ensure your little ones stock up on their healty fruits. BIG THUMBS UP from us! We have written about this hotel before here. Finally, after surviving/falling in love with Bangkok, we took a well deserved island break in Ko Chang. Find out all about our secret Ko Chang beach here.